You are currently browsing the tag archive for the ‘CO2 levels’ tag. What can one person do when 6.8 billion are frying the planet? When the environment is your interest, you get to read masses of articles about the subject. A good 90% of them are very concerning with many extremely concerning. Every now & then I reach a point where I think it’s just too difficult. There is so much pollution, death & destruction & only relatively small pockets of people doing anything about it. Even then, it’s always a struggle to get others involved & to get the authorities/organizations/governments to take notice, take action & make the necessary changes. Climate change denial is an exception as there are huge groups of people & corporations spending obscene amounts of money to get the message out that global warming is hysterical nonsense that should not be believed & they are winning. Unfortunately for their cause of perpetuating human ignorance, selfishness & consumerism, the temperature in first world countries is playing up. Recently California experienced ridiculously hot temperatures that made people question whether the climate change scientists have actually got it right. It’s hard to convince people that nothing is wrong when it’s 118 degrees Fahrenheit (47.7 degrees) for days on end in Los Angeles. Global warming has been affecting people & the environment in third world countries for years, but their situation has been largely ignored by first world governments. The authorities/organizations/governments rely on the fatigue that hits people who are working for the environment (or almost any other cause) as they think they will get tired & drop off & then everything can return back to the status quo. Solar panels on the roof of Tillman Street Childcare Centre in Tempe. They look good to me. So it was with this feeling of fatigue that I came across the following. It is actually a call to join in on 10:10:10, which is a ‘Global Work Party’ happening on 10th October 2010 organised by www.350.org. So far 6,127 carbon-cutting events will take place in 187 countries to raise awareness about global warming. 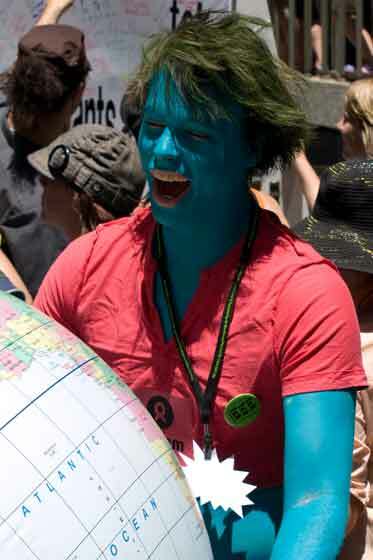 Participants are trying to get the governments of the world to commit to reduce CO2 levels back to 350ppm. Right now CO2 levels are at 390ppm & rising. It’s hard work. Even the US White House was refusing to get solar power panels until this week. That they are going to put solar panels on the White House is seen as a huge act on behalf of the US government, where in fact I think it’s something that should have been done ages ago as a matter of course, not something that a large amount of people had to campaign for months to achieve. Anyway, the purpose of this post is to share something about the environment that is uplifting & actually empowering. It’s a ‘visual essay,’ so it’s easy & fun to read & the message is a good one. Each one of us can do something that will make a difference. 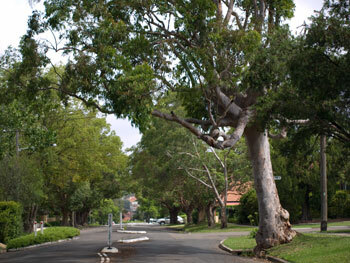 Street trees in Eastwood. 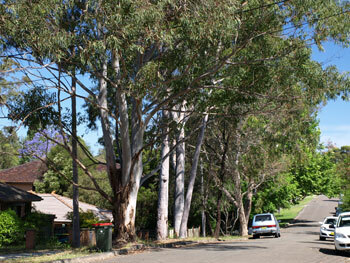 Most of the residential streets in this & surrounding suburbs have many tall trees. Dr Jago Dodson from Griffith University’s Urban Research Program is advocating the creation of many more community gardens in cities saying there will be increased pressure on urban areas to produce food in the future. 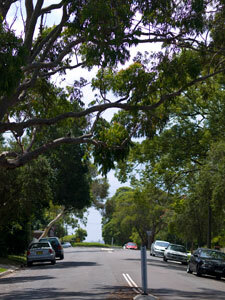 Most residential streets in Chatswood have many tall, shady street trees. This is the norm. Dr Dodson has some innovative ideas that I think are really exciting. Judging by Marrickville Council’s support for the latest verge gardening project in Wilga Avenue & the community garden in Denison Road Dulwich Hill, I would imagine Council will also support other community gardens in the LGA. This year they have said they will provide help in-kind such as removing cement to facilitate such projects & that there are a number of suitable places for community gardens in the LGA. Access to water is the main issue if the gardens are not on the verges out front. I predict community gardens will be as popular as book clubs in the not too distant future & as is with Book Clubs, only limited places are available so it pays to be involved from the beginning. The Journal of Epidemiology & Community Health published research from the VU University Medical Centre in Amsterdam showed that living less than 1km (0.62miles) from a green space had a major impact in lowering the incidence of major physical disease & mental ill-health. The research found that children are less likely to develop asthma if they live in tree-lined streets, particularly in areas with more street trees. 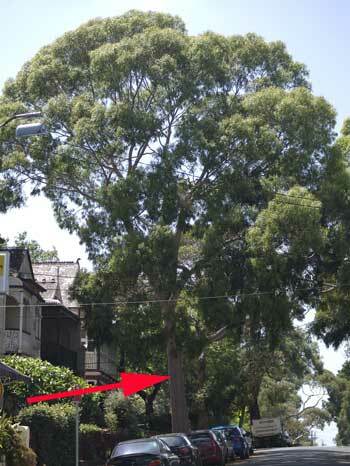 Here, I think they mean nice big trees with a canopy, not the hacked variety that are so prevalent in Marrickville LGA. 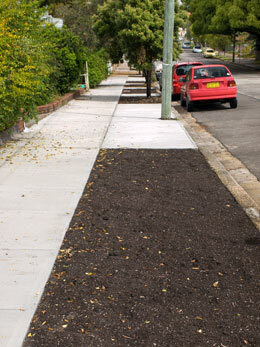 Rockdale City Council planted street trees along both side of the Princes Hwy Rockdale for approximately 2 km. The awnings posed a problem, so each tree was pruned into a ball & these are maintained regularly. 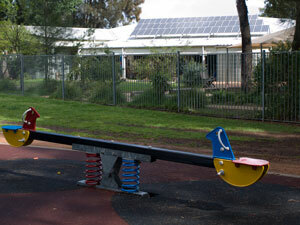 I like what Rockdale Council has done. 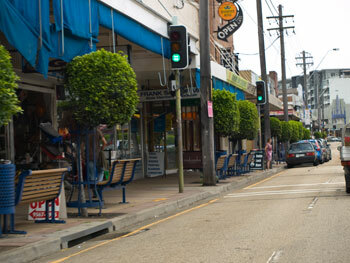 It looks great & brings green every 3 metres along the shopping strip. Every time I mention this to others I watch the disbelief on their faces, yet this estimate is a number I come across repeatedly in research & articles about the value of trees. Try looking in the local community papers in the Real Estate section. If there is a street tree in front of the property, the photographer always includes a branch or leaves from the tree in the photo of the property. They do this because the sight of trees has a subconscious effect on us. When we see leafy green, we get a feeling of peace & safety even if we are not directly aware of this. Leafy green means good place to rear children, safety & happiness. Not to many of us will look at a photo of a property surrounded by cement with no green & compare it favorably with a property that has trees & landscaping, even if the greener property is of lesser value. 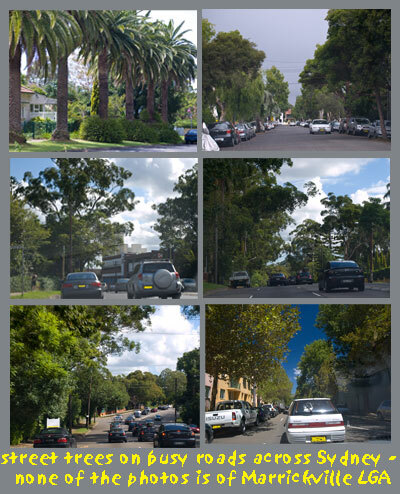 Chatswood, Ashfield, Pacific Hwy & Alexandria - all are very busy roads & they have large street trees at close spacing. 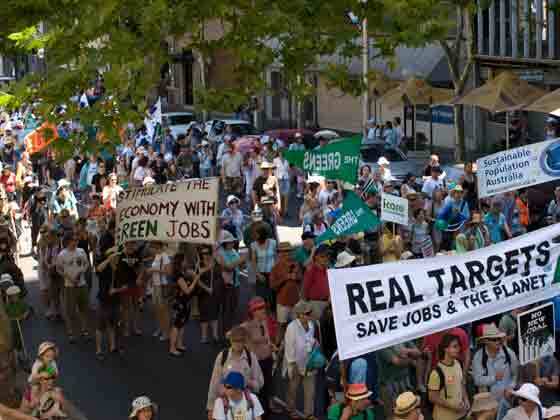 Today we went to the Walk Against Warming, which was organised by the Conservation Foundation of NSW & it was excellent. Martin Place was packed when we arrived & I was lucky to get a space on a bench with a good view of the crowd & the stage. Lots of photos. The police estimated the crowd at around 15,000, though the number was easily 20,000 when, 45 minutes later the walk started. Melbourne apparently had 50,000 people & Brisbane 10,000. A 12 year old girl gave an incredibly articulate & rousing speech. Then she & a group of primary school children sang the winning song of a competition. Goodness, there is talent in our community. I have no doubt, if professionally produced, this song could be in the Top 40. It was great that young people got to be the main speakers as they are the ones to whom we are leaving this mammoth problem. A woman whose name I cannot remember gave a fabulous speech about how ordinary people can participate in action to lobby our politicians to take action on climate change because that’s how she got started. The crowd was made up of people of all ages from a new born to old people needing walking sticks. 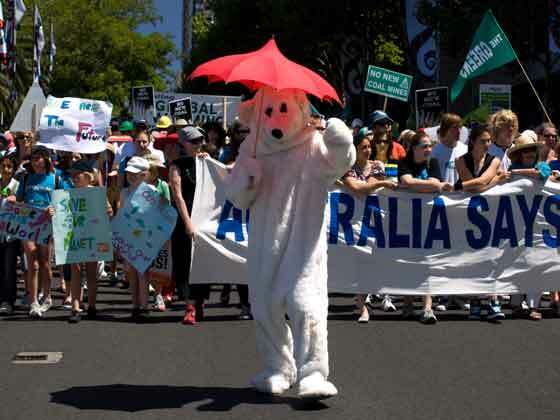 The Unions were there, schools, climate & environmental groups, the Greens, mums & dads & dogs, many dogs. There were lots of young people, which belies what I have been told that they are not interested in the issue of climate change. Apart from the Wilderness Society’s drummers, who were drumming a fantastic samba near the front of the march, it was the quietest march I have ever attended. Everyone was polite & there was absolutely no aggression, though I imagine these events may become more vocal if our governments take no significant action in the near future. It was a total success & I hope the State & Federal Governments take note of what is happening around the country this weekend. My absolute respect goes to the two people who spent this hot afternoon in Polar Bear suits. We were sunburnt, so they must have really suffered. If you haven’t heard of 350.org, they are a group founded by Bill McKibben organizing international community action on 24th October 2009, which aims to convince the governments of the world to agree on a world target of 350 parts per million Carbon Dioxide (350 ppm CO2) in the atmosphere when they meet in Copenhagen December 2009. The web-site at www.350.org has all the facts, but in short, scientific consensus is that 350 ppm of CO2 is the upper level of CO2 to stop the planet tipping into climate crisis. We are already at 389.42 ppm & humanity has to act immediately to stop CO2 levels increasing. The aim is to return CO2 levels back to 350 ppm as soon as possible. Saving Our Trees has just signed up with 350.org to hold 350 TWITTER HOUR – 24th OCTOBER 2009. For more information on how to participate click on the ‘350 action 09’ page at the top of the left hand column.